A toxic friendship can be hard to spot and even harder to shake. Take some time to evaluate what it means to be a good friend and what it means to be a bad friend so you can choose the right friends for your life. Signs of a bad friend include personality traits and behaviors. Just because a person is a bad friend, it doesn't necessarily mean they are a bad person. You don't have to put up with their negative behavior as a toxic friend, but you also don't need to be mean or retaliate against them. Good friends have your back when they're with you and when they're not. If your friend says one thing to your face and something less kind about you behind your back, one of those things is a lie. Trust is the foundation of all relationships, and friendships are no exception. All teens experience peer pressure sometimes, but it shouldn't be coming on strong from your friends. A good friend might ask you once to do something dangerous or inappropriate, but once you decline they'll be okay with it and move on. A bad friend in this scenario might keep asking you to do it, try to embarrass you for saying "No," or stake your friendship on it. If your friend only hangs out with you or talks to you when they want something from you, they are probably a bad friend. This type of person knows how to manipulate others to get what they want, regardless of how it impacts you. When a friend consistently "borrows" things from you and never returns them, asks for money all the time, or only wants to hang when you can be seen together in public, they are taking advantage of your friendship. Keeping secrets is hard work, especially when they are really juicy secrets. A bad friend has no self-control and doesn't care about the consequences of telling your secrets to others. Spilling these secrets could embarrass you or bring harm to you which are things a good friend would never intentionally do. Does your friend always make negative comments about your hairstyle, the clothes you wear, or the number of followers you have on Instagram? Do they say things like "Don't your parents have the money to buy you an iPhone 10?" or "Where'd you get your outfit, the thrift shop?" If you answered "Yes" to these questions, you've got yourself a bad friend. Good friends accept you for the unique person you are. A friend who hears a guy doesn't like you, then suggests you ask him out is knowingly giving you bad advice. A good friend would never set you up for an uncomfortable situation like this. There's a big difference between constructive criticism and put downs. If you had a stain on your shirt, a good friend would whisper to you about it and offer to loan you another shirt while a bad friend would loudly say something like "Geez, Jen, don't you ever wash your clothes?" Good friends do give you their honest opinions but in the most caring way possible. Bad friends simply put you down without any care for your feelings. Whether your friend is lying to their parents on the daily, you, or other friends, it's all bad news. People who lie constantly are selfish and don't really care about the consequences of their actions. Even if they aren't lying to you, you'll never be able to trust this person fully. If the phrase, "Debbie Downer" describes your friend, it might be a sign you're in a negative friendship. Sure, it's normal for people to feel down sometimes, but it's not okay to rain on everyone else's parade constantly. A bad friend tries to pull everyone else down with them whether it's at school, a party, or just hanging out with you. A friend who claims you as a bestie one day, then swears you were never friends the next day can be toxic in your life. By frequently changing your friendship status they are showing that they don't actually care about your feelings. Your friends should be proud to be in your tribe for the long-haul. One of the key components of healthy relationships is forgiveness. You and your friend are both human, so you'll undoubtedly make mistakes. If you really care about each other, you'll find ways to forgive each other and truly move on. A bad friend holds grudges for weeks, months, or even years because they are more worried about their own feelings than your friendship. The point in having friends is to surround yourself with people who want to have fun with you and support you in good times or bad. If your friend is unavailable when your girlfriend breaks up with you, your parents get divorced, or your pet dies, they're probably a bad friend. Bad friendships can result in negative consequences for both the bad friend and the person they are hurting. Eventually, a bad friend might end up lonely and isolated. The negativity can rub off on your other relationships and other areas of your life. Your self-esteem could be lowered. You might experience higher stress levels which can impact physical and emotional health. Following their negative lead could result in harmful or deadly consequences. You could be viewed as a bad friend by association. You have the right to end any friendship at any time and for any reason, but as a good friend you'll want to find the best approach for both of you. 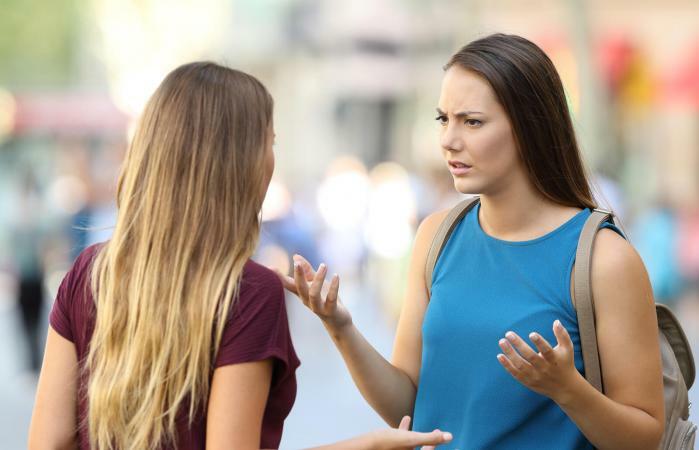 If you're noticing the warning signs of a toxic friend in someone you care about, try talking to them openly before you make any rash decisions. When it's clear they don't care or aren't able to be a good friend, do yourself a favor and move on.